Come home to this Slow-Cooker Orange-Cranberry Pork Roast. 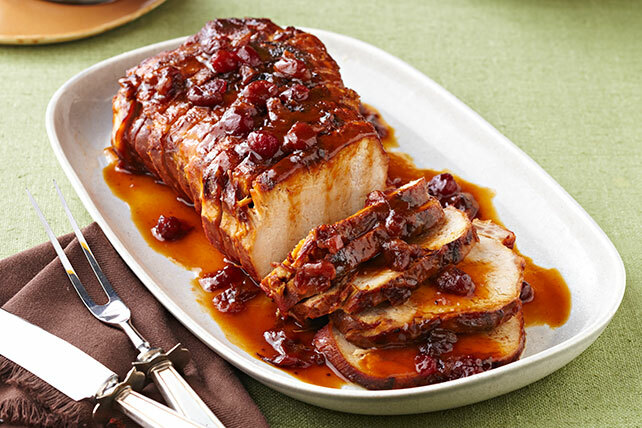 Cranberry sauce and orange work their magic in this Slow-Cooker Orange-Cranberry Pork Roast. Heat oil in large skillet on medium-high heat. Add meat; cook 4 to 5 min. on each side or until evenly browned on both sides. Transfer meat to slow cooker sprayed with cooking spray. Mix cranberry sauce, dressing and soy sauce until blended; pour over meat. Cover with lid. Cook on LOW 4 to 5 hours. Remove meat from slow cooker, reserving liquid in slow cooker. Cover meat to keep warm. Whisk remaining ingredients in small bowl until blended; stir into liquid in slow cooker. Cook, covered, on HIGH 10 min. or until thickened. Slice meat; place on platter. Drizzle lightly with sauce. Serve with remaining sauce. When cooking a pork roast in a slow cooker, it is best to use a wide flat roast since it both fits better in most slow cookers and is less likely to overcook. For best results, do not cook the meat on the HIGH heat setting for this recipe. Prepare using KRAFT Tangy Bacon CATALINA Dressing & Marinade. The sweet cranberry-orange sauce is the perfect complement to the lean pork in this smart slow-cooked entrée that's sure to become a new family favorite.